This is our exercise bike. It fits for cardio exercise. You can use it to exercise when you are watching TV, listening music. Great for leisure exercise, moderate resistance, play effect of exercise, but not very hard. 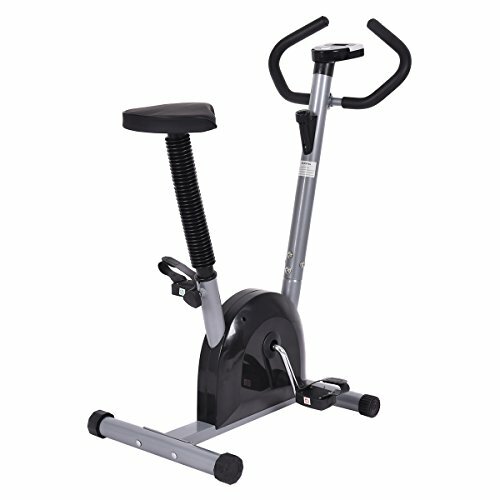 Equipped with large pedals and safety foot straps, this exercise bike resists slippage, proving a safe workout environment. The innovative design also allows you to get on and off easily. A screen can show the sport time, speed and distance, also include how much calories you consume. It is fits for commercial use and home us. Do not hesitate, just buy one. 1.Please consider the weight capacity before purchasing. 2.Please ensure the foot straps are tightened firmly for safety. Adjustable Seat Height: There are total 5 adjusting levels of our Goplus exercise bike seat height, ranged from 37.5"-41.5", which allows you to get comfort for different body figures. Adjustable Resistance: Our exercise bike allows you to adjust the resistance so that you will are able to simulate flat ground cycling , cycling up slight and steep inclines, which will increase difficulty level of cycling and burn more calories. Digital LCD Screen: LCD screen of our exercise bike displays your Distance, Speed, Lasting Time and Calories, which makes it possible to see your results to keep your motivation and to schedule a break. Safe Design: Equipped with safe pedals and foot straps, your feet will be fixed tightly on the pedals while exercising. No Site Limitation: Our Goplus exercise bike is ideal for both outdoor and indoor exercise, as long as there is a ground for placing this cycling machine. You needn't get to the gym early to strive for a good place with other exercisers.